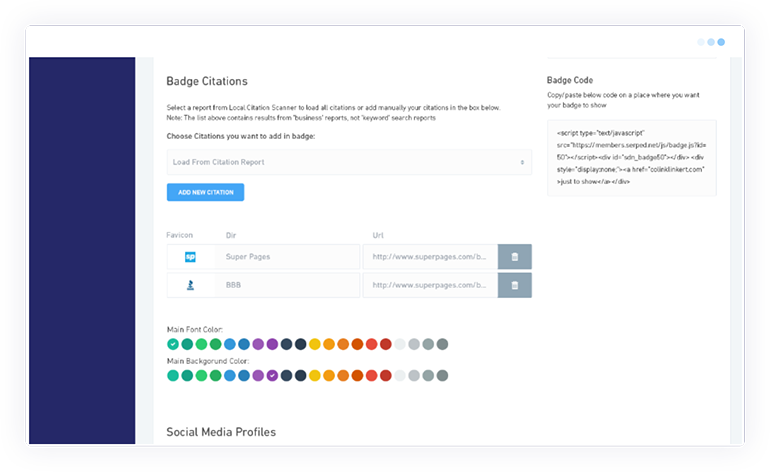 'Review Badges' is a powerful, yet simple tool that allows you to embed badges that link to citation sources on your clients' sites, to help them increase their social proof and get more reviews. This tool is awesome, whether you want to provide additional value to existing clients, or use it as a lead generation tool, to show your prospects how you can help them grow their business. With 'Review Badges', all you need to do is to copy a small piece of code and paste it on your client's site, to provide links to any citation sources where reviews can be left and read. This system also allows you to subtly add a link back to your own website (as a service provider, for example) for SEO benefits and referral traffic. Setting up 'Review Badges' on a client's site will take you less than 5 minutes, and will help their business increase their social proof and get more reviews, which can help them rank higher in the search engines, both locally and globally. The more reviews a business has, the more chances it has to get top rankings. A larger amount of reviews will also increase your clients' conversion rate, ensuring more income generated as a direct result of your SEO efforts.